"Life Spacies" is an interaction and communication space, where remotely located visitors can interact with each other through evolutionary forms and images. "Life Spacies" enables visitors to integrate themselves into a 3 dimensional complex virtual world of artificial life organisms that react to the visitors body movement, motion and gestures. The artificial life creatures also communicate with each other and so create an artificial universe, where real and artificial life are closely interrelated through interaction and exchange. A "Life Spacies" web page allows people all over the world to interact with the system as well: by simply typing and sending an email message to the "Life Spacies" web site, one can create one's own artificial creature. The creature will then starts to live in the "Life Spacies" environment at the ICC's museum, where the on-site visitors directly will interact with it. "Life Spacies" is based upon the idea of evolutionary design, which means that the artists did not pre-design creatures, but the design of the creature really depends on the interaction of the visitors and the evolutionary process itself: the messages sent from people all over the world and the reproduction and evolution of the creatures themselves will decide how the creatures will look. Thus one can not really predict how the creatures will evolve and what kind of creatures will appear in "Life Spacies". It will all depend on how many people will send messages, how complex these messages will be and how the creatures will reproduce among themselves in the "Life Spacies" environment at the ICC Museum. As the exhibition will last one year, the commission of "Life Spacies for the ICC Museum is therefore a great chance to see how the piece and the species will evolve over time. "Life Spacies" is a system, where interaction, interrelation and exchange happens on a human-human, human-creature, creature-creature and human-environment, creature-environment and life-artificial life level. By touching the creatures with ones hands, one can interact with them.The creatures are basically shy and one needs to look for them carefully as they hide in the branches of the vegetation. Once the creatures are disturbed, they will come out of their nests and move around in space. When a person is alone in his/her interaction space, he/she can clone a creature by catching it with his/her hand. When the creature got caught, it will make a perfect copy of itself, a clone. After the cloning process the creatures try to escape again. If two remotely located people are in the same virtual space, they each can catch a creature with their hands at the same time and then watch these two creatures mating. 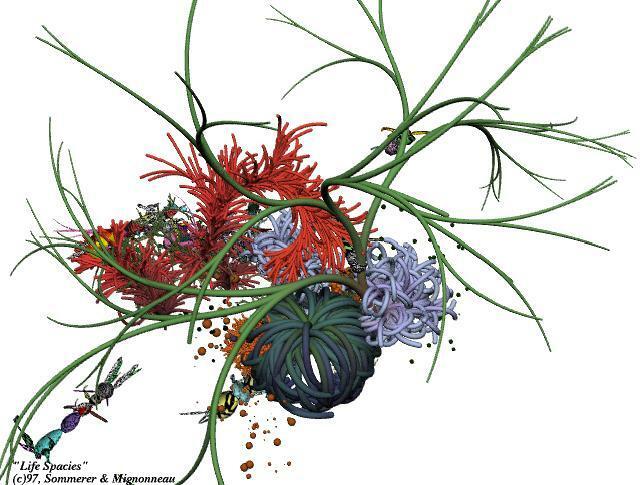 If the creatures mate, they will produce an offspring which is the genetic mix of its parents.After the mating process the three creatures will try to escape again into the branches of the virtual plants. As the interaction rules are non-deterministic and multi-layered, an open system is created where each entity, whether real life or artificial life, whether real present (at the ICC Museum) or virtually present (the users on the net, or the creatures as code) is regarded as an equally important entity of a complex life-like system. "Art as a Living System"
The universe according to Bohr is a indivisible dynamic whole who's parts are essentially interrelated on a subatomic level. Significant is the duality character of the subatomic particles; they are two complementary descriptions of reality, where both of them are partly true. Based upon the insight that interaction per se and the interrelation between entities are the driving forces for the structures of life, Sommerer and Mignonneau as artists are investigating the interaction and the creative process as such. Creation is not any more understood as expression of the artists inner creativity or "ingenium"(according to Hegel), but becomes itself an intrinsically dynamic process, that is based upon the interaction between the human observer, his/her consciousness and the evolutionary dynamic and complex image processes of the work, which themselves are based upon principles of artificial life, evolution and dynamic non-local interrelations (= "Art as a Living System"). "Life SpaciesII" was originally developed for the ICC InterCommunication Museum in Tokyo as part of the museum's permanent collection. It is an artificial life environment where remotely located visitors on the Internet and the on-site visitors to the installation at the ICC Museum in Tokyo can interact with each other through evolutionary forms and images. Through the "Life SpaciesII" web page, people all over the world interact with the system; by simply typing and sending an email message to the "Life SpaciesII" web site (http://www.ntticc.co.jp/~lifespacies), one can create one's own artificial creature. We developed a special text-to-form coding system that enables us to use written text as genetic code and translate it into visual creatures. In a way similar to the genetic code in nature, letters, syntax and sequencing of the text is used to code certain parameters in the creature's design functions. Form, shape, color, texture and the number of bodies and limbs are influenced by the text parameters. As there is a great variation in the texts sent by different people, the creatures themselves also vary greatly in their appearance. As soon as a message is sent, the produced creature starts to live and move around in the "Life SpaciesII" environment. Depending on the complexity of the written text message the creatures body design and its ability to move is determined. Some creatures might move very fast whereas others might be slower. Creatures also look for food and aim to eat text characters that can be interactively released by the visitors: creatures always eat the same characters as contained in their genetic code. For example "John" creature will only eat "J", "o", "h" and "n". Since other creatures might want to eat the same characters as well, competition among creatures for certain types of food will occur. Creatures also might starve and die if they do not succeed to catch enough text characters. On the other hand if a creature has eaten enough food (=text characters) it will look for a mating partner and bear a child. Offspring creatures will then carry the genetic code of the parent creatures and live and interact with the other creatures in "Life SpaciesII." "Art as a Living Process"
Based upon the insight that interaction per se and the interrelation between entities are the driving forces for the structures of life, we are investigating the interaction and creative process as such. Creation is not any more understood as expression of the artists inner creativity or "ingenium," but instead becomes itself an intrinsically dynamic process that is based upon the interaction parameters and the evolutionary image processes of the work. C. Sommerer and L. Mignonneau, "VERBARIUM and LIFE SPACIES: Creating a Visual Language by Transcoding Text into Form on the Internet," in IEEE Symposium on Visual Languages (VL'99) Conference Proceedings, (Tokyo, 1999), pp. 90-95. In 1997 we produced Life Spacies for the NTT-ICC InterCommunication Museum in Tokyo as part of their permanent collection. It is an interaction and communication environment where remotely located visitors on the Internet and the on-site visitors to the installation at the NTT-ICC Museum in Tokyo can interact with each other through artificial creatures. Artificial creatures are created by on-line participants through writing email messages to the Life Spacies web page. Each text message is encoded into the genetic code for a creature, our in-house text-to-form editor allows us to translate text into 3D shapes. When a text is written into the Life Spacies web site GUI an email message is generated and an artificial creature starts to live in the interaction environment at the NTT-ICC Museum..
Our text-to-form editor links the characters and syntax of the written text to specific parameters in the creature’s design. The default form of a creature is a body made up by a sphere consisting of 100 vertices, 10 rings with 10 vertices each. All vertices can be modified in x, y and z axes to stretch the sphere and create new body forms. Several bodies can also be attached to each other and several limbs can be generated through the text as well. According to the sequencing of the characters in the text, the parameters of x, y and z for each of the 100 vertices can be stretched and scaled, the color values and texture values for each body and limb can be modified, the number of bodies and limbs can be changed and new locations for attachment points of bodies and limbs can be created. In translating the characters of the text message into these design function values, we assign an ASCII value for each character. This is done according to the standard ASCII table. When messages are sent, the incoming text modifies and “sculpts” the default module by changing its form, size, color, texture, number of bodies/limbs, copying parts and so forth. Depending on the complexity of the text, the body and limbs of the creature become increasingly shaped, modulated and varied. As there is usually great variation among the texts sent by different people, the creatures themselves also vary greatly in appearance, thus providing a personal creature for each author of a text. 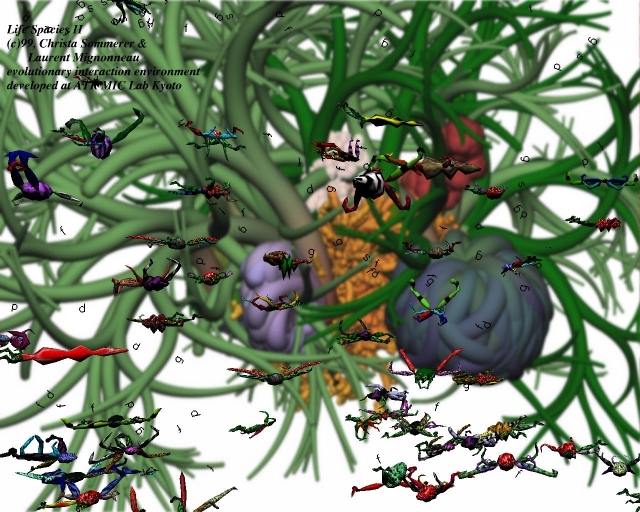 As soon as this message is sent to the server in Tokyo, the creature starts to live in its virtual environment and the author of the text receives a picture of his or her creature in return. When more complex messages with more characters, words and varied syntax are sent, more elaborate creatures with more bodies, limbs and variation in body form, texture, size and color can be created. The interaction setup in Tokyo consists of two independent interaction sites that are linked together via a data line, allowing visitors at remote locations to be displayed and interact in the same virtual three-dimensional space. On-site visitors in Tokyo can directly interact with the creatures through touching and catching them in the immersive environment. Users see themselves integrated into the 3D environment on the screens and they can play with the creatures through gesture-based interaction. If a visitor for example catches a creature it makes a perfect copy of itself, but if two remotely located visitors each catch a creature, these two creatures mate and create an offspring creature. In this case, the offspring inherits the genetic code of the parent creatures; this is done through cross-over of the parents’ codes with some minimal mutation. A creature’s default life span is 24 hours, but as the life span is also a function from the design function table it will be updated and changed through the values of the specific characters in the text. When the creature has died, a report is given to it's author, telling him or her how long the creature lived and how many children and clones it produced. Life Spacies is thus a system where interaction and exchange happens between real life and artificial life on human-human, human-creature and creature-creature levels. The system is multi-modal as it combines a gesture-based interface and a keyboard-based interaction. The use of the system is very intuitive as users need only to move around in the 3D environment and play with the creatures by catching them through their hand gestures. A detailed description of the system and its follow-up system Life Spacies II is provided in literature . Life Writer consits of an old-style type writer that evokes the area of analogue text processing. In addition a normal piece of paper is used as projection screen and the position of the projection is always matched with the position of the type writer roll. When users type text into the keys of the type writer, the resulting letters appear as projected characters on the normal paper. 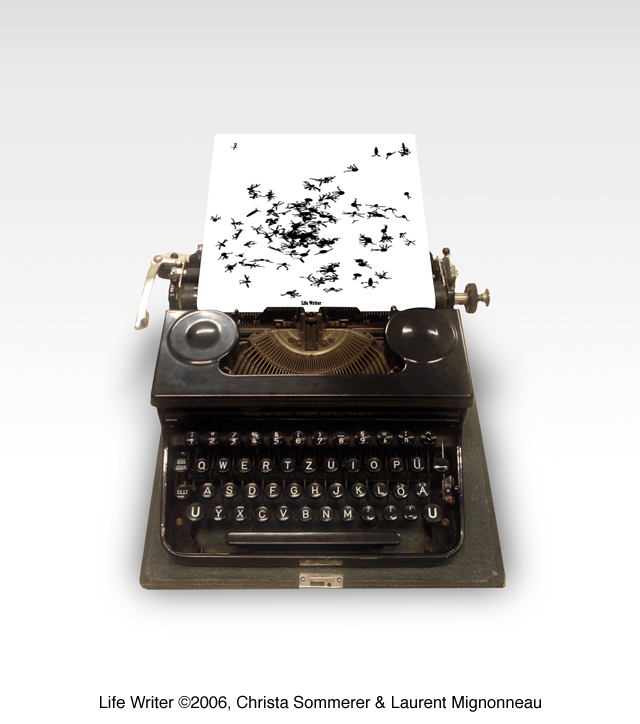 When users then push the carriage return, the letters on screen transform into small black and white artificial life creatures that appear to float on the paper of the type writer itself. The creatures are based on genetic algorithms where text is used as the genetic code that determines the behaviour and movements of the creatures. The algorithms were developed for one of our previpus works called Life Spacies  and here the text functions as genetic code for the creation of artifical life creatures. As in the Life Spacies system the artificial creatures created by the act of typing can be faster or slower depending on their genetic code and body shape. All of the artificial life creatures also need to eat text in order to stay alive and when users type a new text the creatures will quickly try to snap up these characters from the paper in order to get energy. Once creatures have eaten enough text they can also reproduce and have off-spring so eventuelly the screen can become very full when creatures a fed well. The user can also push the creatures around when using the scroll of the typing machines cylinder. She can for example push the creatures back into the machine which will crush them or scroll the creatures off the screen alltogether, making new place for new creatures. Sommerer, C. and Mignonneau, L. 1997. "Interacting with Artificial Life: A-Volve," In: Complexity Journal. New York: Wiley, Vol. 2, No. 6, pp. 13-21. Sommerer, C., Mignonneau, L. and Lopez-Gulliver, R. 1999. "LIFE SPACIES II: from text to form on the Internet using language as genetic code," In: Proceedings of the 9th International Conference on Artificial Reality and Tele-Existence (ICAT'99), Tokyo: Virtual Reality Society, Dec. 1999, pp. 215-220.